As a parent, you want to get your baby off to the right start in life. Many parents worry about their children's health, especially with skyrocketing rates of obesity and other issues. Gaining knowledge about what and when to feed your baby can give you peace of mind. Your schedule will vary based on the age of your baby. Consult the following chart for basic information about the proper feeding amount for your baby. Compare your baby's current schedule by weight and by age to see how it lines up with recommendations. You can also start with how many ounces your baby eats to see if that matches up with his or her size and age. In total, baby should have two to three ounces of formula per pound of body weight each day. Breast milk is stimulated by feedings, so in the first week baby will eat less than one ounce per feeding, but by 4 weeks can be eating up to 5 ounces per feeding. 4 to 6 months 14 to 17 lbs. While some mothers begin mixing rice cereal into formula during this time, the World Health Organization suggests breastfeeding exclusively (or formula) until the baby is six months old. 6 to 9 months 16 to 20 lbs. Cereal: 1-3 tbs. 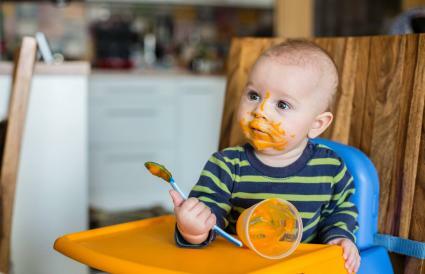 Introduce one solid food at a time and watch for reactions. Wait 1-2 weeks before introducing a new food. Start with rice cereal and then add mild pureed fruits. Dr. Sears recommends introducing finger foods at this stage. You can print out a baby feeding chart similar to the one above for quick reference at home or on the go. In addition to what baby should be eating, you'll also see what they should not be eating yet at each age. A basic, printable baby feeding chart allows you to track feeding time, bottle or specific breast, duration and amount, diaper changes, and baby's mood so you can see what baby's current schedule looks like. Be prepared to meet your baby's nutritional needs with a detailed month-by-month baby feeding schedule. Feed baby on an "on demand" schedule during this period of their lives. This will likely be about every 1-1/2 to 3 hours for formula or breast milk, which is about 8 to 12 times per 24-hour period. Breastfed babies will eat more frequently because breastmilk digests more quickly. Week by week newborn feeding schedules in the first month change drastically for breastfeeding babies as milk supply and baby's stomach size change. Newborns drink about 1 to 3 ounces of formula or breast milk per feeding and work their way up to about 4 to 6 ounces by age four months. Feed only breast milk or formula. Do not introduce solid foods like rice cereal during this period. Newborns should never go more than four hours without food, even at night. Regular feeding is important to establish milk supply during breastfeeding. Crying is a late sign of hunger. KidsHealth.org suggests offering breast milk or formula every two hours (from the time you started the last feeding). If you begin to introduce solids during this period, do so gradually. Introduce a single food and watch baby closely for signs of allergies or reactions before introducing another. Babies should only be given pureed fruits or cereals at this time. Breast milk or formula should still be the main source of nutrition. While some mothers use rice cereal in formula to get baby to sleep through the night, babies still need to eat every 4-5 hours at this time, and should not go much longer than 6 without food, even at night. Continue to introduce foods gradually. This is a critical feeding time because babies also begin to establish lifelong taste preferences. Because you want your child to have a healthy start in life, feed healthy, whole foods like fruits, vegetables, and whole grains. Avoid foods like sugar, white flour, and fast food. Offer juice in a cup, not a bottle, and only give 3 to 4 ounces of non-citrus juice per day (apple, pear, and grape). Your child's food choices will continue to expand during this time. Offer a balanced diet with a variety of healthy fruits, vegetables, whole grains, and dairy products. Continue to monitor for signs of food allergies, and make sugary, processed, and fast foods sometimes snacks instead of everyday foods. You may discover that certain months find your baby wanting to nibble all day long. Just when you think you are raising a little pig, she refuses to eat a meal or two. Babies have growth spurts when their bodies need more calories and nutrition. You should follow your baby's need. She'll let you know when she is hungry. Continue to offer her a variety of foods, but don't try to force her to eat more than she wants. Putting your baby on a feeding schedule can be trying at times, but you and your baby can also enjoy many mealtimes together. All babies have unique needs. The best way to make sure your baby's nutritional needs are being met is by seeking regular well-care checkups and discussing any questions or concerns with your healthcare provider. By doing this and feeding your baby a nutritious diet, you will set your child up for a lifetime of good health.